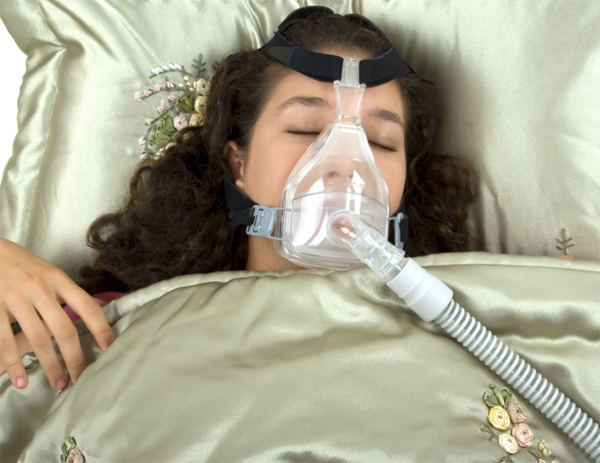 Many individuals have heard of sleep apnea and continuous positive airway pressure, commonly referred to as CPAP, and like to joke that a CPAP mask looks like a jet pilot mask or Darth Vader's mask. Joking aside, CPAP masks are an imperative component to receiving therapy. You or a loved one may need to select a mask either now or in the future, and it is important to know its basic anatomy, the different styles, and proper care. Once you have been diagnosed with sleep apnea and prescribed positive airway pressure (PAP), you will need to select a mask to receive the therapeutic pressure. A mask consists of several fundamental components, including headgear, frame, cushion, and a cushion clip. However, if you're interested, you can select a mask with more "bells and whistles," but that breakdown is the basic anatomy of a CPAP mask. It is vital that you find a mask that you deem comfortable and provides the necessary seal for your prescribed airflow. The necessary pressure level cannot be achieved unless you are fit correctly. Additionally, choosing a comfortable mask will make using positive airway pressure therapy an overall more enjoyable experience. While you are searching for a comfortable CPAP mask, keep in mind the fit, size, and style. For the proper fit and size, you will need to set up a mask fit session with your durable medical equipment company or your sleep clinic where you had your sleep study. To determine which style to select, you just need to know your personal preferences. There are three main styles of CPAP masks: full face (covers your nose and mouth), nasal (covers your nose only), and intranasal (rests inside your nostrils only). A full face mask is ideal for mouth breathers or individuals that switch between nose and mouth breathing. With a full face mask, you never have to worry about out of which orifice you're breathing. Congested or sick? This mask will still work and you will still receive proper airflow. Additionally, individuals that only breathe through their nose still prefer this style because it feels like less pressure, as there is more room for the airflow to circulate before entering your airway. However, some patients don't prefer that large of a mask, as they see it bulky or cumbersome. If you prefer a smaller and sleeker mask, you can choose a nasal or intranasal style. A nasal mask will only cover your nose, and, on the same prescribed pressure, may feel like more than a full face mask. The smallest style, an intranasal CPAP mask, will rest gently on the inside of your nostrils and will feel like you're receiving even more pressure, as it being directly blown into your airway. If you know that you breathe through your mouth, yet prefer smaller styles, you can couple your mask with a chin strap. Masks are engineered to stabilize themselves by method of headgear. Here is where using a CPAP mask can get tricky. You don't want the straps to be too tight or too loose; you need to find that magic sweet spot where your headgear is snug enough so that it's not causing pain, discomfort, or leaking. Many masks integrate "quick release" clips of some form so that you do not have to mess with the adjustments every time you need to apply and remove it. However, hook and loop closures will start to give and lose its elasticity over time. We recommend that you undo the hook and loop closure about once a week, slightly tug, and then place it back down on the headgear. Depending upon your needs, you can select a CPAP mask made of silicone, synthetic rubber, vinyl, or gel-like materials. Different materials will hug the contours of your face differently, so make sure to try different styles and cushions. In addition to a wide selection of materials, many masks feature an adjustable forehead pad, which allows users to make fine-tune adjustments that will alleviate pressure on their forehead, bridge of nose, and sinuses. 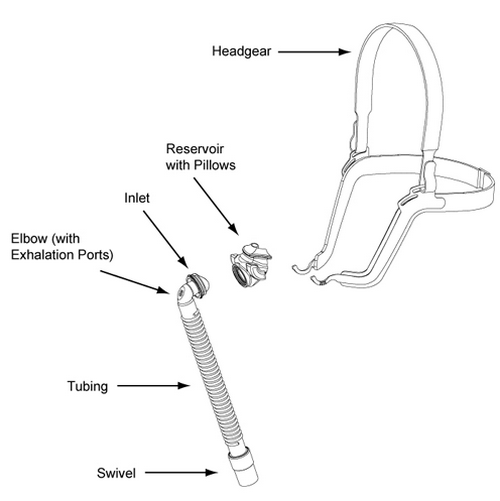 Many masks, furthermore, integrate an elbow assembly that rotates 360 degrees so you can sleep in any position without becoming confined or wrapped up by the CPAP tubing: instead, the tubing will swivel with the mask as turn throughout the night. To ensure proper care of your mask, it is highly recommended that you clean your mask daily, as the cushion cover will start to break down from the oils from your skin and will cause leaks. By cleaning your mask daily, you will drastically increase the life of it and prevent leakage of your prescribe pressure. You can clean your mask with normal detergent and water. Please note that by cleaning with hard water, it will leave spots on your cushion; the spots are merely an aesthetic blemish and your CPAP mask will continue to function properly. You always want to be happy with your mask. If a CPAP mask ever causes you pain or discomfort, make sure to test out other masks with your durable medical equipment provider or sleep clinic. There are, quite literally, dozens of different masks to accommodate different facial structures and preferences. New masks are constantly being developed and engineered, too. Make sure you know your needs and wants prior to shopping for your CPAP mask at Vitality Medical.